Discover how a dental implant can renew your smile with the help of Dr. Maher Barsoum. If you have an unsavable tooth or root due to fracture or decay, Dr. Barsoum can place a dental implant AT THE TIME of the extraction. Tooth loss can happen for a number of reasons, such as tooth fracture, decay that reaches the tooth nerves and roots, or periodontal disease. While we always strive to save natural teeth with quality restorative treatments, extraction is sometimes the better choice to help preserve the health of the rest of your mouth. Most patients are understandably devastated at the prospect of being seen without all of their teeth, but if you visit Maher Barsoum, DDS or one of his on-staff periodontists to obtain same-day dental implants in Upland, Chino and Chino Hills, your transition from tooth loss to replacement teeth will be seamless. Even though you can replace your missing teeth with a denture or a fixed bridge, dental implants offer several advantages over these methods. Bone loss in the jaw is an inevitable side effect of tooth loss because you lose the natural tooth roots that stimulate the bone to keep it dense. Dentures and bridges rest on top of the gums at the site of tooth loss and do not provide this stimulation. However, dental implants are titanium posts that are embedded in the jawbone just like real tooth roots and effectively keep the bone healthy and strong. This function of dental implants helps prevent the sunken facial appearance that makes people with tooth loss appear older than they are. Implants also hold your tooth restorations firmly in the jaw so that they feel as stable as your natural teeth, unlike removable dentures that may fall out of place. 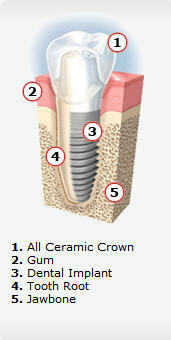 Placing implants also doesn’t require removing a portion of your healthy teeth, unlike a crown-and-bridge system. What are my implant dentistry options? Your implant dentist in Chino, Chino Hills and Upland can replace a single tooth or multiple teeth with dental implants, and in most cases, the procedure can be performed immediately after extraction. For one missing tooth, we can place a single implant in the jawbone and top it with a crown made of natural-looking ceramic materials that match your other teeth. For multiple missing teeth, we’ll place two or more implants to stabilize a bridge. To replace all of the top or bottom teeth, we can anchor a full denture with four or more strategically placed implants. With traditional implants, you’ll have to wait up to six months for the titanium cylinders to integrate with the bone — a process called osseointegration — before obtaining your permanent restorations. However, your Chino dental implant dentist can give you temporary restorations so that you don’t have to go without teeth for even a day. If you already have a denture that is unstable and desire a less extensive implant procedure, your Upland dental implant dentist offers mini dental implants to anchor your prosthetic in place. This procedure uses smaller implants that require less healing time, allowing most patients to walk out of our office with an implant-supported denture in just a few hours. If you have any questions about Dental Implants, please contact Dr. Maher Barsoum in his Chino or Upland office or make an appointment on-line. 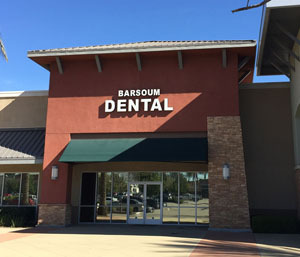 Dr. Barsoum has provided top-notch implant dentistry in Upland, Chino and Chino Hills for over 30 years and has an experienced periodontist on staff who places implants as well. If you need teeth extracted and want to replace them immediately, contact our dental office today to schedule your consultation for same-day dental implants.